I love cookies and am always on the lookout for new recipes, especially new almond cookie recipes, because almond is Grant’s favorite. Way back when we were in language training at FSI, he once had a particularly long day, so I decided to bake him cookies as a surprise. Knowing I didn’t have almond paste and I didn’t have almonds, my almond cookie options were limited. So I found a few recipe that looked pretty easy and fast and changed them around to get the recipe posted below. On this particular day, I was in the middle of creaming the butter and sugar when I suddenly realized I didn’t have almond extract! Big fail. So I stopped my mixer, tore off my apron, and literally ran to Safeway (well, it was more like speedwalking). While there, I grabbed a couple of things I also needed for dinner so we wouldn’t have to go out later. Then I got back to the apartment as quickly as possible so I could finish the cookies before Grant got home. As I was unpacking my bag, I couldn’t find the almond extract. It wasn’t there. This had now graduated from a big fail to an EPIC FAIL. Somehow, the almond extract hadn’t made it off the conveyor belt and into my bag (fortunately, I hadn’t been charged for it). Plus this particular store is notoriously awful so I wasn’t incredibly surprised. 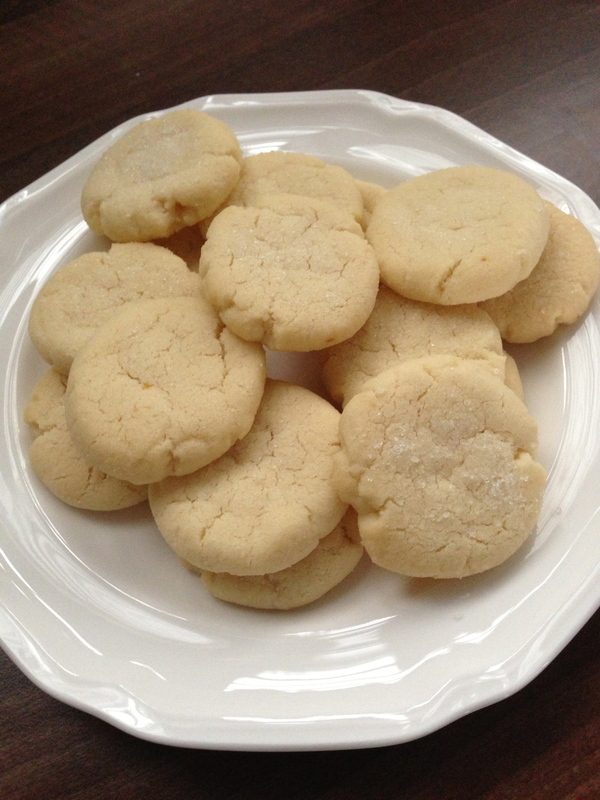 But by now it was raining and the clock was ticking — so I made the cookies vanilla (adding just over a teaspoon of vanilla extract) and they were delicious. Try not to eat all of them right away. Seriously, they’re that good. I made a batch of these last week when I had someone over for morning tea (we don’t do coffee in our house) and an hour and a half before she was due to arrive, realized I had nothing to serve her other than a little bit of fruit. And Grant had the car. So I threw the recipe together, baked one tray, wrapped up the rest of the dough to put in the fridge so we could have fresh cookies later, and was completely ready (with a clean kitchen!) ten minutes early.